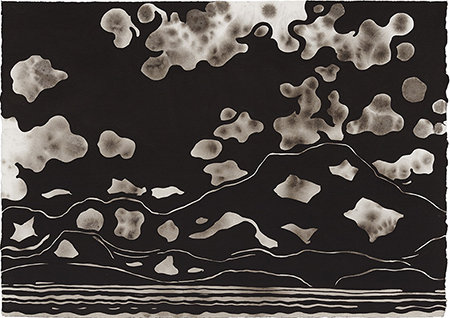 Eric Wolf, "Maine," 2017, ink on paper, 29 x 42"
Since 1989, New Yorker Eric Wolf has been making one- and two-week artistic journeys to Phillips Memorial Wilderness Preserve in Maine, absorbing the place’s natural beauty by “sleeping, eating, working, [and] daydreaming” there, a described by art writer Davd Masello. Wolf speaks of the preserve (near Oquossoc, Maine) as inspiring “a creative burst of energy that I work through until it ebbs.” Ten monochrome ink-on-paper landscapes from Wolf’s latest “immersion” pilgrimage show that the artist (who had his plein-air epiphany years ago at Monet’s garden at Giverny) captures his experience of land, water, wind and clouds in compressed, graphic form, without the attractions of color. Wolf executes each in one session before the motif, recorded in bold, calligraphic black strokes, delicately modulated grays, and pictorially active unpainted white spaces. The artist is clearly references Asian landscape painting, but with an elemental dynamism suggestive of American modernists like Rockwell Kent, Marsden Hartley and George Bellows (another Maine devotee). With their abstracted flat shapes, one can also see in them the urban and urbane presence of Roy Lichtenstein. Wolf’s wind-roiled waves and tattered or rolling clouds convey a hint of Albert Pinkham’s Ryder’s and Edvard Munch’s similarly solitary, pantheistic visions (albeit, in those cases, of nocturnal Brooklyn and rural Norway). In Wolf’s Maine marines, seen in “Oquossoc,” “Reflection,” “Storm Sky,” “Bald Mountain,” “Observatory Mountain” and “Mooselookmeguntic Lake,” we revisit nature, primordial and magnificent.